Generally recognised as a great way to start large scale gliding. The full size K8, from the famous Alexander Schleicher factory, first flew in 1957 and was a derivation of the K6 but with a structure similar to that of the two seater K7. It is a robust 15 m glider ideal for club use with good flying characteristics and is particularly useful in weak thermal conditions. The model is accurate in profile having been scaled using works drawings from Schleicher, but deviates from the scale wing section. We opted to use a Quabec 15% thick, 3 % camber section to give best flight performance. 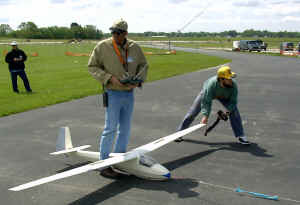 The Flair K8 has become one of the best known large scale gliders on the soaring circuit and is regularly seen featured in model magazines. If you want to get into scale gliding or you are an enthusiast looking for a new project try this you will not be disappointed. Forgive our lack of modesty but we will quote from the S & E Modeller review July 1999, "excellent scale fidelity, superb kit quality and completeness, easy to build and fly due to well engineered kit design". It gives us real pleasure to read reviews such as this. 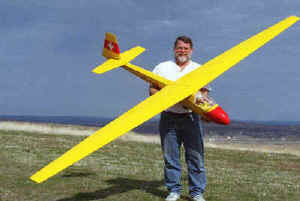 This is Don Bailey with his ASK8. Don was the reviewer for S & E Modeller. Superb flying shots of a Flair K8 by Alfred Parzer from Vienna. Flying Scale Models March/April 1998 UK. Only adhesives and covering are required to finish the airframe. The full size K8, from the famous Alexander Schleicher factory, first flew in 1957 and was a derivation of the K6 but with a structure similar to that of the two seater K7. It is a robust 15 m glider ideal for club use with good flying characteristics and is particularly useful in weak thermal conditions. We have chosen to model the K8b, believing that the larger canopy on this variant makes for a more stylish looking glider. The model is accurate in profile having been scaled using works drawings from Schleicher, but deviates from the scale wing section. We opted to use a Quabec 15% thick, 3 % camber section. The tip section of the wing, (from the inboard end of the ailerons outward), incorporates a transition from 3% camber to 5% camber with washout. This ensures that the whole wing works all the time and that the stall is well behaved. We have flown the model at the basic weight 9.5 lbs, as built with Solartex covering, and also with 3.5 lb of ballast. In both cases the handling is superb but with greater penetration ballasted. The model should be ideal for those looking for a large scale glider with character as an alternative to the more modern glass ships. The wing is conventional, separating on the centre line, with sheeted D box and hardwood webbed spar. All ribs and additional shaped parts are die cut from liteply. CNC machined parts are supplied for scale double acting airbrakes. The fuselage is a self jigging construction made from die cut liteply parts to which stringers and longerons are added. The nose is a glass fibre moulding. The tailplane is bolted on to enable removal for transport if required.